Although the b-side to Buster’s Idea credits Drumbago, these are some of the first independent recordings of Prince Buster’s All Stars, then known simply as Buster’s Group which consisted of Drumbago [Arkland Parks - drums], Clue J. [Cluett Johnson - double bass], Jah Jerry Haynes or Ernie Ranglin [guitar] Aubrey Adams [piano], Stanley Ribbs & Roland Alphonso [Tenor Saxophone], Don Drummond & Rico Rodriguez [Trombone]. 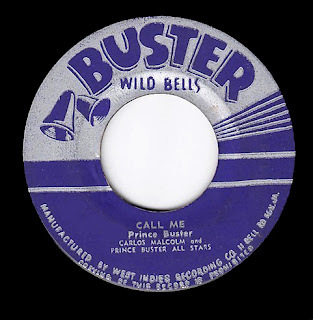 With the flavour of a field recording with similar call-and-response styling to that of the Maytals, I Met A Man is notable for the music being close to having only one note; on the flip, fusing for the first time the mento and burru elements of The Folkes Brothers, Buster with his group managed to lay the cornerstone of Jamaican recorded music with this absolute classic; with the title shortened to Carolina this was also a hugely successful UK release on the Blue Beat label in 1961. A formidable shuffle praising the early dance venues and pulsating sound system scene where musical gatherings were an opportunity for all folk to join in at this once desirable residential area of West Kingston, on the street side and at the corner of Beeston Street and Matthews Lane; reprising an earlier track, Beeston Street Riff by Clue J & his Blues Blasters [Federal - FDR 569], previously recorded with Coxsone Dodd in 1959, this time with full horn assault alternating Alphonso and Rico with Prince calling out in the second part; the b-side is the instrumental version with a more latin percussion arrangement of a tune popularised by Tommy Edwards and later Johnnie Ray and written by Ramon Getzov & Sid Frank. Suspected to be a later addition to this set from 1964 and featuring Carlos Malcolm’s backing singers and a keyboard riff sounding like it’s out of Jackie Mittoo’s bag, this is Buster’s Group very much in full swing ska mode. The b-side is the exact same recording previously released as Poison On Beeston Street. Some R&B with horns of the finest order on the A-side, the trombone and saxes weaving skillfully over a skanking shuffle beat and a little Jah Jerry guitar break; on the flip, also known as Jumping With The Duke, there’s Rico and Group exploring with a considerable amount of swing something in-between Mongo Santamaria and Georgie Fame, also the first sign of Buster shouting encouraging calls during the recording. Bunny & Skitto benefit from an inspired collaboration with Count Ossie & His Warrikas that mix their njabinghi drumming to the duo’s simple dirge (Cassavubu). Jackie Estick joins the Group to voice a slice of R&B with a honking Rolando (Alphonso) and a little guitar solo attempt from Jah Jerry. 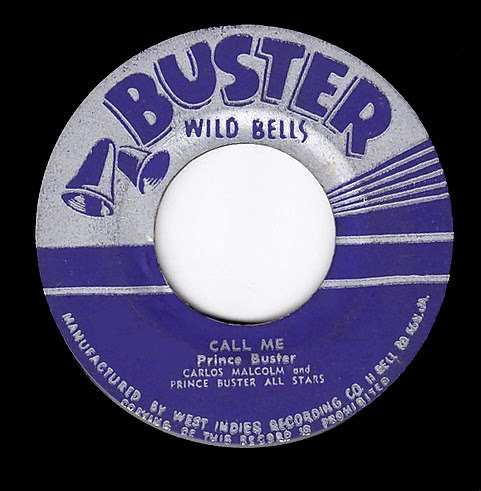 also known as Golden Rule this is representative of Derrick Morgan’s output enjoying a long and fruitful association with Buster - these shuffle ballads seem deliberately off-beat yet are memorable for their unique approach to melody which is unmistakably Jamaican. Eric “Monty” Morris was renamed Humpty Dumpty for a while due to the huge success of this ska treatment of the popular nursery rhyme where Ribbs and Alphonso stand out on the horns while the Bagonaires shuffle on contentedly. On the flip a wall of horns featuring Stanley Ribbs with Roland Alphonso and Rico Rodriguez who adopted the name The Blues Blasters for this session; also known as Buster's Hop the original title is shortened to Corn Bread & Butter on the UK edition on Blue Beat. Rico takes the lead credit for this driving shuffle inspired by the original location where sound system pioneer Tom “The Great Sebastian” would play; on the flip Prince Buster voices a rhythm & blues ballad augmented by doo-wop style vocal backing and a juicy trombone solo. Classic double whammy from “Monty” Morris; on the a-side predicting the gun craze that was soon to blight the streets of Kingston and surroundings, while Ranglin lays down the ska lick down over Drumbago’s syncopated shuffle there’s the ubiquitous Roland Alphonso counterpointing with flair; on the flip the tempo is upped thanks to Jackie Mittoo chopping away at the organ along a nice line of horns while Eric reflects on his unsatisfied wife with his trademark cheeky delivery. This one is an oddity and we won’t be seeing more of the mysterious Lloyd Flowers who is crooning a couple of R&B numbers skilfully backed by the immortal Rico Rodriguez accompanied by Buster’s Group. The one with Derrick Morgan was one of Prince Buster’s most fundamental and fruitful collaborations with dozens of productions voiced by the unmistakeable Jamaican singer. This didn’t last too long as soon after breaking ranks the duo would start a slandering match often peppered with colourful language attacking one another’s affiliations flamboyantly begrudging resentment and mutual contempt with the proverbial tongue stuck firmly in cheek.